Jákup á Borg, Player of the Year 2006, on the left in a red/black jersey. On Sunday it was revealed that Jákup á Borg had been voted as Player of the Year 2006. It was hardly any surprise that Jákup won the honor, as he has been in sensational form for HB Tórshavn this season and was the main reason behind HB's title win. Of HB's 61 goals, Jákup scored 11 and was involved with probably 90% of the others. 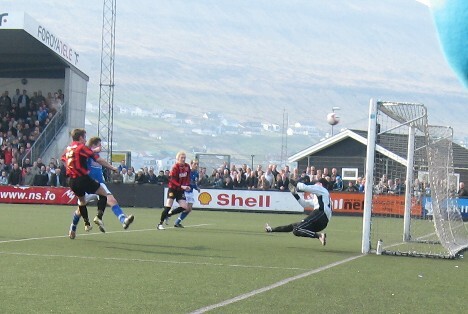 EB/Streymur's goalkeeper, René Tórgarð, was chosen as Goalkepper of the Year. René was originally drafted to EB/Streymur in 2005 as emergency replacement for injured Gunnar á Steig, and was from the start of 2006 EB/streymur's no. 1 goalkeeper and has in record speed evolved to one of the very best goalkeepers in the country. Maybe he didn't draw the big headlines in the media during the season, as those were mostly left for EB/Streymur's offensive players, but never the less, he was one of the main factors behind EB/Streymur's successful season (successful, even though EB/Streymur "only" became runners up, after having led the season from start to finish) and surely, the coach of the national team must have noticed too... René should expect a phone call from Jógvan Martin Olsen before the next gathering of the national team. In 27 matches René kept 7 clean sheets this season. HB Tórshavn's championship-winning coach, Krszyztof Popczynski, won the Coach of the Year award. And well deserved, it was. From playing some very uninteresting soccer last season, Popczynski has transformed HB to play some very attractive soccer this season. This was Popczynski's first season with HB. The Young Player of the Year award went to EB/Streymur's 20 year-old forward, Arnbjørn Hansen. Arnbjørn was more or less a completely unknown player before the start of the 2006 season and also for the first 8 rounds of the league, but after he scored his first goal in round nine in the 90th minute against VB/Sumba, he never looked back and scored 11 goals in total during the league. Arnbjørn Hansen is seen as one of the brightest forward-talents for a long time and his displays this season have already seen him included in the national team. He's got good technical skills; he's quick and strong with the head and finishes from all angles (with his feet, that is:-). A very exciting player for the future, indeed. The Golden Boot Award was for the second time in succession handed to Christian Høgni Jacobsen of NSÍ Runavík, who became top scorer in the Formula Divison with 18 goals. The same amount of goals as last year, by the way. Christian Høgni's soccer-future has not been revealed yet, but it's unlikely he will continue with NSÍ. – He hopes to get a contract abroad, but should he fail to do so, the rumour has it that he will join HB Tórshavn next season.